Working as a freelance professional in Spain can be costly taking into account Social Security charges, IRPF (income tax) rates, accountant and advisor fees, not to mention transport and living expenses. However, the Income Tax Return, filed quarterly and annually (by June 30 2015 for 2014 taxes), will gauge how much you’re taxed on your operating profit (income – costs) plus any personal deductions and exemptions so there is scope to reduce the taxable total by noting precisely all your costs and by keeping your detailed invoices. Additionally your quarterly VAT bill can be reduced by providing information for which VAT you have paid out during that time period relating to your profession. The System allows many deductible expenses so make sure you keep your invoices and contact us should you need help managing it. 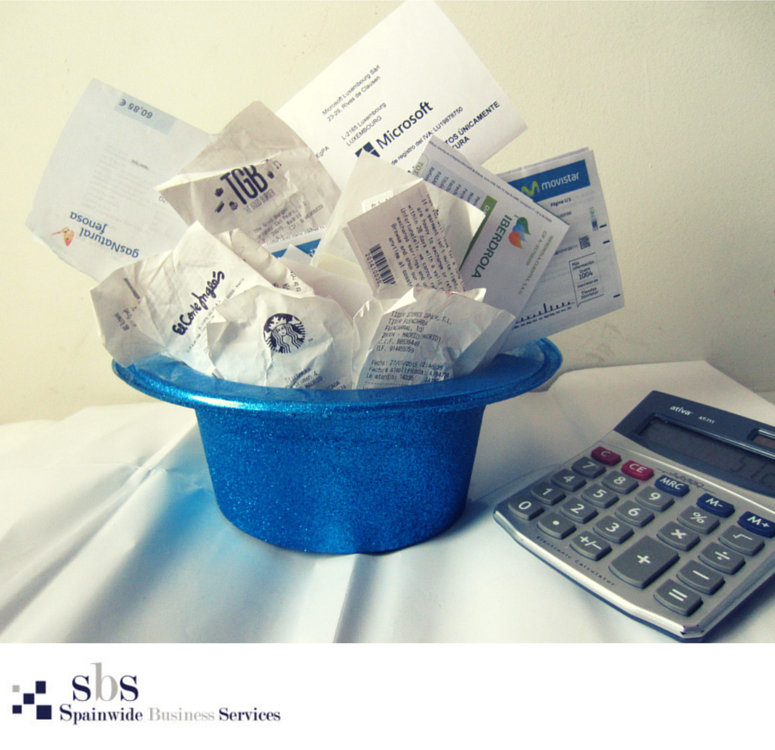 Firstly, as you are taxed on your profit, keeping a note of any costs will reduce your total taxable sum. Secondly, the VAT you have paid for in purchasing goods or services can be taken off your quarterly VAT or IVA bill if you have charged VAT on your own invoices. It will be calculated as the total VAT you have charged out for your business minus any VAT you have paid for goods/services related to your business. Thirdly, you may receive a surprise tax inspection letter from Hacienda requesting to see evidence of the calculations provided in the tax returns, so make sure you are organised. 3. What counts as an expense? Costs of goods related to your business needs: stock for physical goods, materials, office supplies, business cards, printer ink, stationery, office furniture, packaging etc. If you work from home and have a registered home office you can deduct a percentage of utility bills depending on the total proportion of space used for your business, usually around 30% capped at 50%. E.g. Your home is 90m sq and your home office is 9m sq you can deduct 10% of total bills. If you hire people to work for you or your clients their pay or fee is noted as a cost, and if they’re your employees the Social Security you pay for them too is also noted. A car or van, plus the insurance, maintenance and service costs are 100% claimable as an expense if the vehicle has been bought particularly for the business with exclusive use and is necessary to carry out the work activity and therefore seen as a capital expense. E.g. Taxi driver, chauffeur, deliveries… not so much for driving to work to give classes. If the vehicle is also for personal use then this cannot be claimed at all (even proportionally). However you can claim up to 50% for VAT returns. Petrol if using your personal or work car for a business trip. Make sure the receipt is in your name! Car park tickets, NB the machines at the airport allow for a full receipt! And any car park tickets outside your registered province or comunidad. Parking fines are not deducted! Other travel such as train, taxi, flights are expenses if you demonstrate it’s for business purpose (e.g. flights to Berlin for the Mobile App conference!) and the receipt’s in your name. Restaurants, bars, cafés… If it’s with clients or business contacts and considered as a Public Relations expense it qualifies as a business expense and you should ask for the receipt in your name! Food, hotel and travel costs can be deducted, though capped, if they have been incurred out of the community you are registered in. NB. If the expense item is more than €600 this will be treated as an investment for which there are special rules regarding the deductibility of the depreciation value to be calculated. 4. Keep organised and ask for help! Every self-employed worker has a method that suits them best, but organising invoices by month and category may be a straight-forward way to begin. Many deductions depend on your specific profession and other personal circumstances, so it is recommended to hire a trusted accountant or business advisor who can help you in these matters. Spainwide has been helping freelance and self-employed professionals for 20 years so do not hesitate to give us a call. Remember to keep all your detailed receipts for the quarterly VAT (IVA) returns and annual income tax return (declaracion de la renta) and we can help lower your tax bill. Call us on the number above or send us an email to see how we can help you manage your freelance business. Hi there! Thanks for the list. Hi Kris, Pleased we could help!